Though I promised myself to spare this blog from all the drama, I just cannot help but pour out my frustrations into writing. So I am very sorry blog. I'll be making this quick. 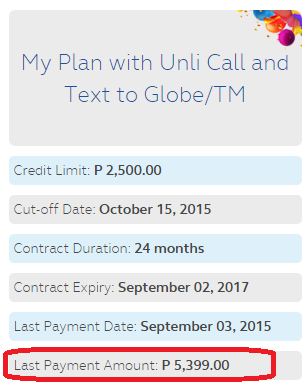 I got an additional line from Globe. 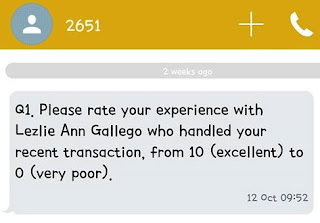 The handset was delivered last September 1 via Air21. 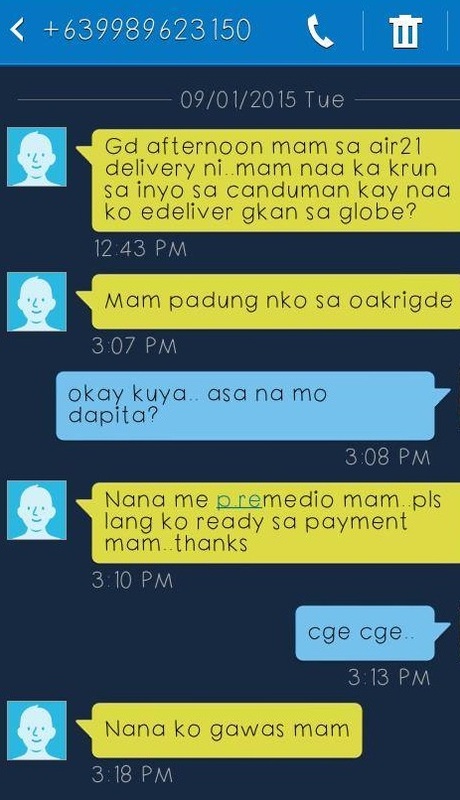 Here's a screen shot of our conversation via SMS with the courier. I handed the courier Php5800 (Php999 Advanced Monthly Service Fee + Php4800 Cashout for the handset). 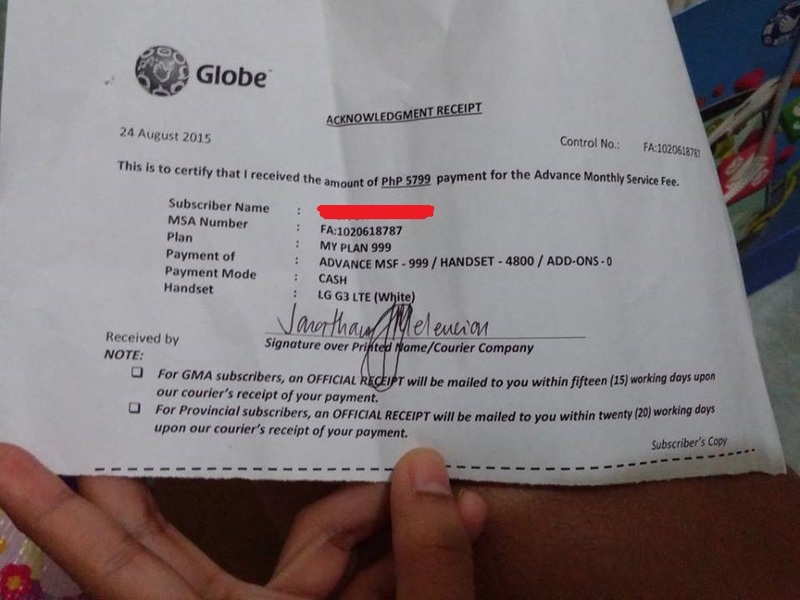 The courier then gave me the one-peso change and the receipt. 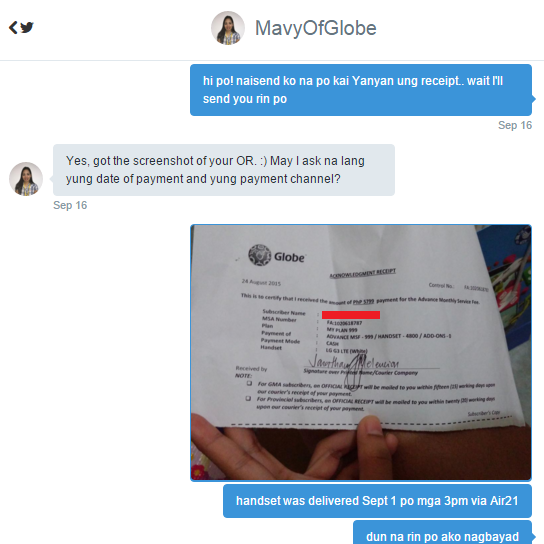 Although it was mentioned on the courier's receipt that I would receive an OFFICIAL RECEIPT via email after 20 working days, I did not. So I checked on the Globe website to make sure. And tadaaan! The amount reflected on the site is NOT the actual amount that I paid! 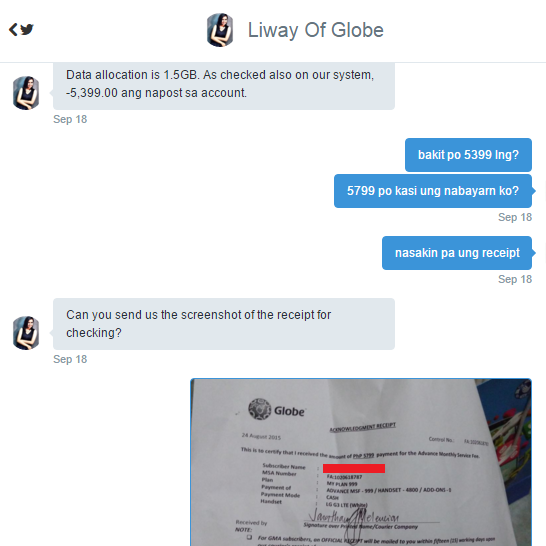 I raised this concern over to Twitter because I know how active the Globe Twitter agents are. But this has just frustrated me more! Please see below for a series of I-had-to-start-over-from-the-beginning-even-if-they-told-me-they-have-the-updates conversations. UGH! Just for the lack of proper term. And there! 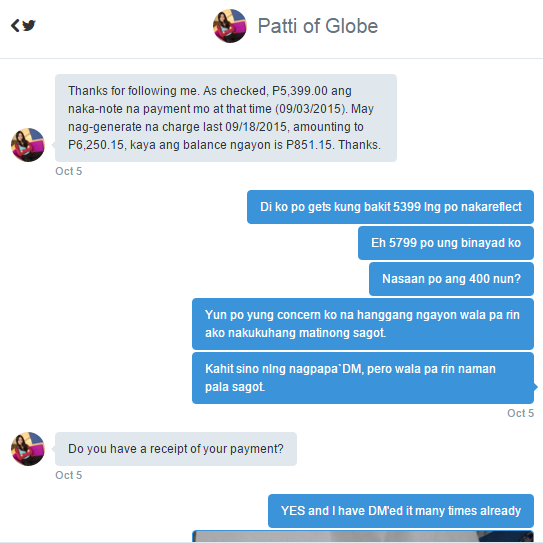 Patti of Globe did send me a reference number for followup of my concern. However, I feel that I cannot trust the Twitter agents to handle this. 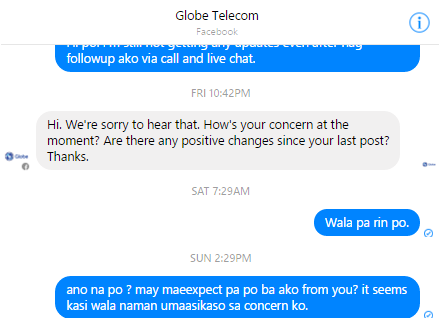 This time, I called customer service wherein the agent told me that the resolution they had for my problem was to REPRINT THE RECEIPT. REPRINT WHAT!? 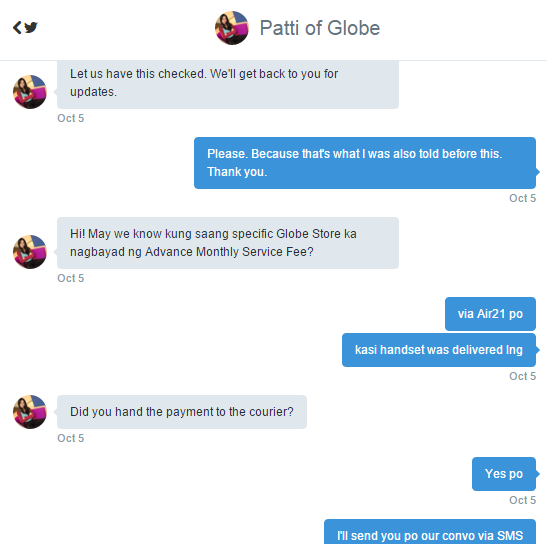 The same amount of Php5399!? 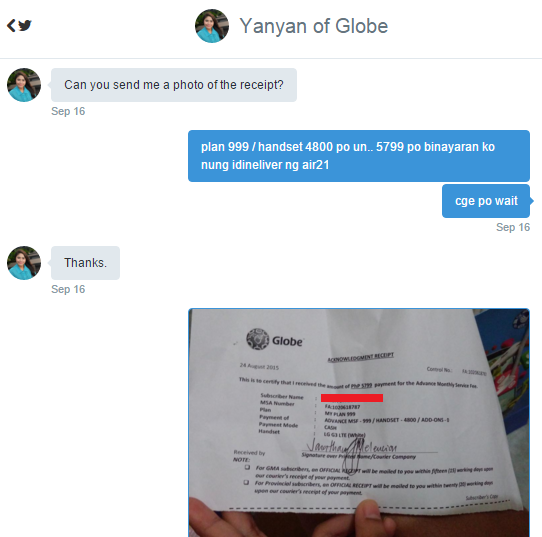 So I clarified to her that my concern is I got an unposted payment of Php400. She left me on dead air for more than five minutes! 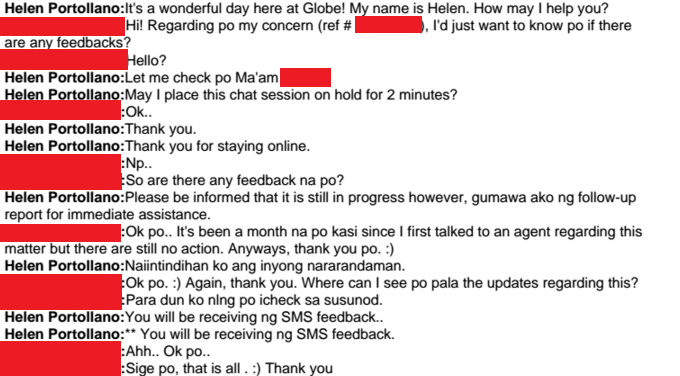 When she got back on the line, she told me she made a follow-up report on this and I should wait for 24-48 hours for a feedback. A couple of days has passed, still there's no update. I tried live chat this time and below is the transcript of our conversation. 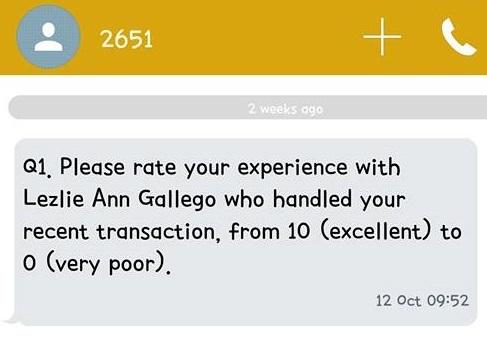 And up until today, I am still not getting any feedback. I am really frustrated right now. Has anybody else experienced this? Let me know on the comments section below.